#10 Old Fashion tableware and #13 Clear apple set! I placed them on a dolls house emporium shelf, I really like the glasses on the 4th shelf, they have a picture of bambi and thumper from disney?! and come in 6 beautiful colours! The clear apple set is my favourite in the collection, too cute! I love these sets too, but I guess they're too big for the Lundby scale? Yes, the apple set is too big! 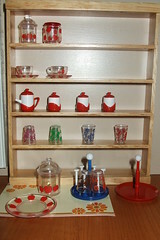 :-(, but the red and white ones from the #10 Old Fashion tableware set on the 3rd shelf can work in lundby scale.